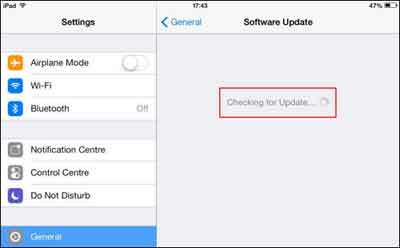 iPad updates: iOS Edition explains in simple steps how to update your device's operating system. iOs updates occur on average every 12 months (with some interim minor revisions in-between). 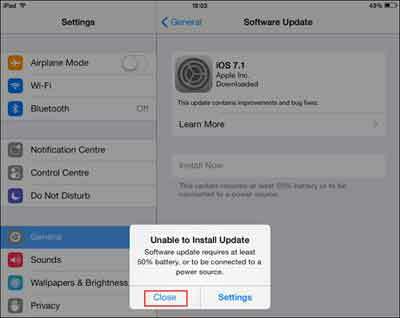 Therefore it is important you keep your Apple device up to date, particularly for bug fixes and user improvements. It is a straightforward process, as you will see in a moment. Unfortunately I find there are lots of home users who find the process confusing. Therefore, with the help of the images showing the process step-by-step, we dispel this confusion so updating your device's iOS becomes the straightforward task it really is! A tutorial on how to update iOS 8 is also available. Do you have any comments to make about this page? Have you encountered issues updating your iPad? Add a Facebook message below. 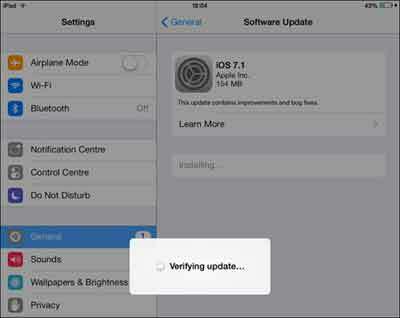 In this section we look at what needs to be done to prepare for downloading your iPad's iOS update. Have your iTunes password to hand as you need this in a moment. The Software Update screen shows you details of the iOS update available for your iPad, including the size of the latest version available. If you tap the Learn More option on the above screen, the following screen appears which details all of the changes, improvements and bug fixes included in the iOS update. As iOS updates are fairly infrequent, the changes listed tend to be quite substantial. I always read this information so there are no surprises once the update is completed. When you tap the Download and Install option, a check is performed for any further updates issues by Apple for your device. This ensures you receives the latest update available, and avoid having to follow the process twice if you checked for updates previously and decided not to go ahead at the time. When the latest iOS version is confirmed, the standard Apple Terms and Conditions page appears. Tap Agree in the top right hand corner to proceed. I bet very few read License and Terms and Conditions pages. At 43 pages plus it is heavy going. It covers things like license conditions for using inbuilt codec's (what enables video to work) and statements such as the one below when using Facetime. "By using the iOS Software, you agree that Apple may transmit, collect, maintain, process and use these identiﬁers [e.g. your login details] for the purpose of providing and improving the FaceTime feature." Do you truly know what you are agreeing to when you tap the Agree link? The literature is full of disclaimers and conditions such as the example above. Would you tap Disagree after reading the fine print? 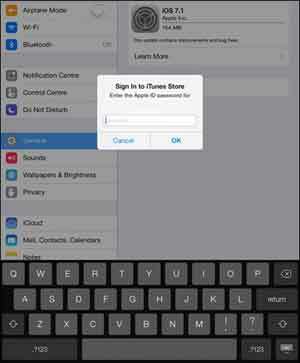 Next your iPad requests you enter your iTunes password. Enter your password then tap OK to begin the download process. After entering your iTunes password the download process begins. A blue status bar and a countdown shows where the download is up to. Ensure your device is appropriately charged, or even better, plugged in to the mains. As you can see below, if your iPad has less than a 50% charge, the iOS update cannot take place. When the iOS source files are download, tap Install Now. You of course have the option not to go ahead with the update right this very second. You can continue this process later if you so wish. At this stage the Terms and Conditions page appears. It is the same page that appears in Step 4 above. Tap Agree when ready to proceed. Part of the download process is the Verification Stage. This is where integrity checks and other verifications take place, ensuring your download is not corrupted or invalid in some way. The installation process happens automatically. All you can do at this stage is either watch the process in action or go and grab a coffee and check back in the next 30-50 minutes or so. If you decide to watch the process you see status bars like the one pictured below. 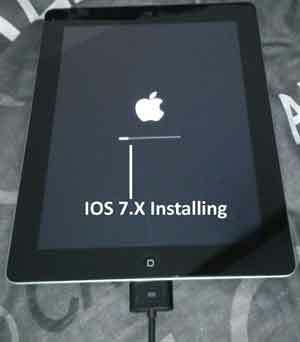 Your iPad restarts several times during the process. When the iOS is fully installed, your iPad presents the login screen (which may look slightly different to pre-update). 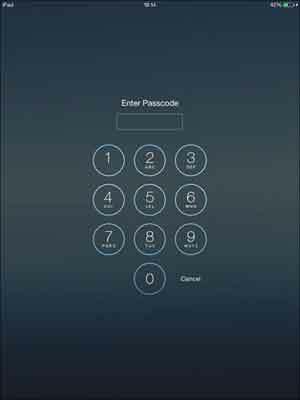 Swipe To Unlock then enter your current Passcode. 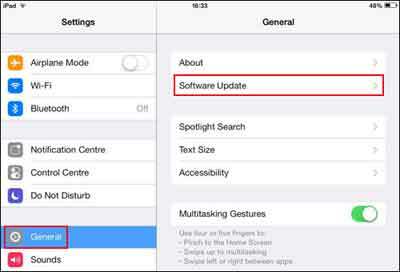 To confirm you have the latest iOS update, tap: Settings > General > Software Update. If your device has the latest iOS version installed, the following message is displayed. If you don't have the latest version installed, your iPad performs a check by accessing iTunes and comparing the latest version to the one you currently have installed, and the process above begins again. So there you have it. iPad updates, whether they be iOS or Apps, is really straightforward. It is prudent to perform the following checks and observations, just to confirm there are no issues. Check the Apps you frequently use. Do they work as expected? What is your iPad's performance like - Better/Worse? If you encounter any issues with your Apps simply update to the latest version. If you are already using the latest version, uninstall and re-install.